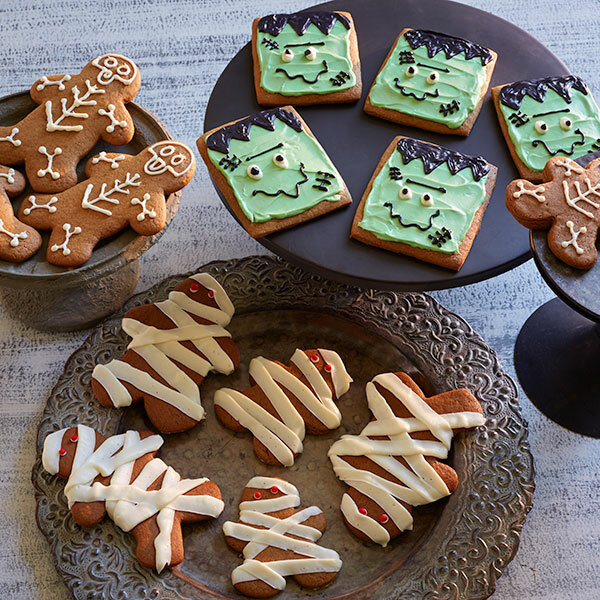 Gingerbread cookie dough from the grocery store can make all three of these monster-themed Halloween cookies. Our Gingerbone Men, Gingerbread Mummies and Frankenheads Halloween treat recipes feature store-bought dough and icing plus red candies, chocolate chips and a little food coloring. Do one or all of these Halloween Gingerbread Cookies—they’re frightfully easy! Make cookie dough for cutout cookies. Refrigerate dough for at least 1 hour before rolling out. Place dough on a lightly floured surface and cover with wax paper. Roll dough to ¼-inch thickness. Cut out cookies: For skeletons and mummies, use the gingerbread man cookie cutter. For Frankenheads, use the knife or pizza cutter to cut dough into 3-inch squares. Re-roll dough scraps as needed. A small amount of additional flour will keep dough from sticking. Place cookie cutouts 3 inches apart on a baking sheet. Bake cookies according to recipe or mix instructions. Remove cookies from oven and let them fully cool on cooling racks before decorating. To make the Frankenheads, tint the vanilla frosting green using green and yellow food coloring. Frost the square cookies. Add white chocolate chips upside down for eyes. Use a tube of black frosting fitted with a small round tip to draw in pupils, hair, eyebrows, mouth and scars. To make the gingerbone men, prepare a pastry bag with a small round decorating tip and fill bag with frosting. Draw a skeleton on each cookie. To make the gingerbread mummies, prepare a pastry bag with a small leaf decorating tip. Fill bag with frosting. Draw long horizontal stripes of frosting for the gauze. Add small red candies for eyes.